Make a bee buffet in your backyard. Lure pollinators to your vegetable beds by planting nectar- and pollen- producing flowers among your beans, eggplant and peppers. We did just that in this narrow raised bed in the Sunset Test Garden. 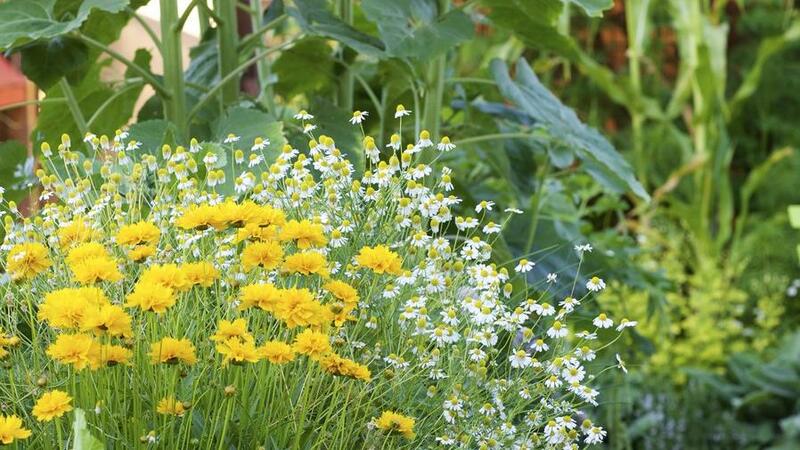 White flowers of old-fashioned German chamomile, a great tea variety, bloom next to golden Coreopsis ‘Early Sunrise’. In the foreground, we’ve let our thyme go to flower and winged visitors often cover its pale pink blossoms. In the background, sunflower stalks shoot skywards with the promise of producing pollen-rich blooms the size of dinner plates in early fall. Remember, you have our blessing to keep growing veggies through the drought. Be sure to hook it up to drip irrigation (you’ll actually have more vegetables with less water) and grow only what you need and varieties you love.